The Audi TT is a 2+2 coupe and a performance efficient roadster that is in its second generation now and in this era of tough competition Audi needs to facelift the car to maintain its position in the segment because the second generation TT look very outdated at this point. Well, Audi is a sensible and clever automaker and therefore the upcoming 2014 model of the Audi TT will get a detailed facelift for which audi also promised that the revamped TT will shed some significant pounds and will be more performance oriented and composed than ever. The new 2014 Audi TT gets some significant changes and the most important out of which is the retirement of performance efficient RS trim. The exterior of the Audi TT is already stylish, striking and head turning and looks very unique. The 2014 TT has a flair coupe like roofline, single frame grille and U-shaped roll hoops in convertible, LED running lights, power adjustable side view heated mirrors, dual exhaust outlets, fog lights and some lines on the sides of the car. From certain angles the car just amazed people but as the exterior is not fully redesigned so you can easily get the same look and charm as like on the previous models. The Chief designer of the Volkswagen Walter de Silva said that the styling and final look of the Audi TT 2014 is just approved and this time the TT will carry a balanced, refined and well crafted exterior as about the first generation the styling was reported as excessive and for the 2nd generation it was considered as lenient. The new 2014 TT is a blend of the best styling features of its predecessors with some new and strong features. Audi is one of those automakers who never allow the folks to criticize because they have a track record of designing well appointed luxurious car’s interior. The Audi TT uses high end material to deliver utmost luxury and comfort, a three spoke flat bottom steering wheel with a small airbag pod and paddle shifter, 5 seats (coupe), 2 seat (roadster), automatic climate control, leather upholstery whereas the roadster adds baseball glove stitched leather trims, LED ambient lighting, 12-speaker BOSE sound system, parking system with rear sensors and Bluetooth, wireless technologies for mobile phone. 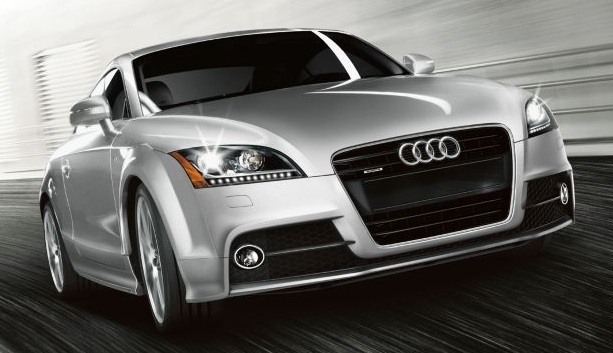 Standard safety features on the Audi TT 2014 include 4-wheel ABS, electronic brakeforce distribution, post collision safety system, a bunch of airbags including driver knee and thorax airbags, stability control and traction control. The roadster adds roll bars to ensure occupants safety. At the heart of the 2014 Audi TT fits a 2.0 liter turbo 4-cylinder engine that outputs 220 horsepower and 258 lb ft of torque. The all wheel drive and a six speed S-tronic dual clutch automatic transmission with Haldex Traction LSC system are standard. The acceleration from 0-60 mph is 5.3 seconds (coupe) and 5.6 seconds (roadster) at a top speed up to 130 mph. The EPA estimated fuel economy is 22 mpg city and 31 mpg highway. The starting price for the coupe Audi TT is $38,650 and for the roadster is $41,650 and the rumors suggest that the TT will make its world debut at the Geneva Motor Show next year. BMW Z4, Mercedes Benz SLK350, Scion FR-S convertible. The new TT doesn’t make any significant changes to attract the customers and has any old technology and interior features if we compare it to the 2009 model it is almost same. The fun of the 2014 TT is the roadster that is very adorable and fascinating. The TT needs some big changes to impress its customers and to give a tough time to its rivals.